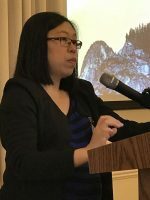 Dr. Chai was asked to speak at the Medical Society of Delaware for the Physician’s Emeritus Luncheon. Below are photos of her speaking to the group of physicians. We are very proud of Jing! 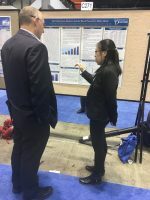 She was awarded the Louise Little Award and submitted her research findings as a first author to the Annual Conference of Experimental Biology (EB). 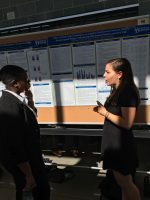 The paper was accepted and she presented her research along with Dr. Chai in Chicago, April 2017. 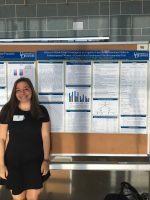 Cara Cicalo, Nicole Kushner, and Jessica McMahon were selected for the 2017 Delaware Summer Scholars. 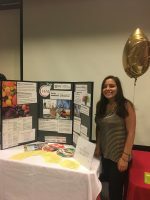 Each of them worked with Dr. Chai and compiled their findings from the Fructose and GRAPE studies. 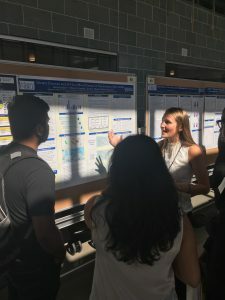 Below are pictures of them presenting their research posters. 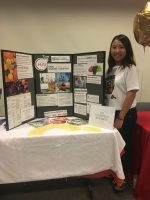 Our volunteers can be found at multiple events, sharing our studies with the community and actively recruiting new participants. 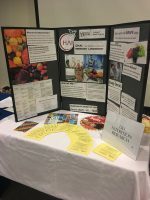 Here, Cara and Iris attended the Newark Healthy Living event on Main Street.